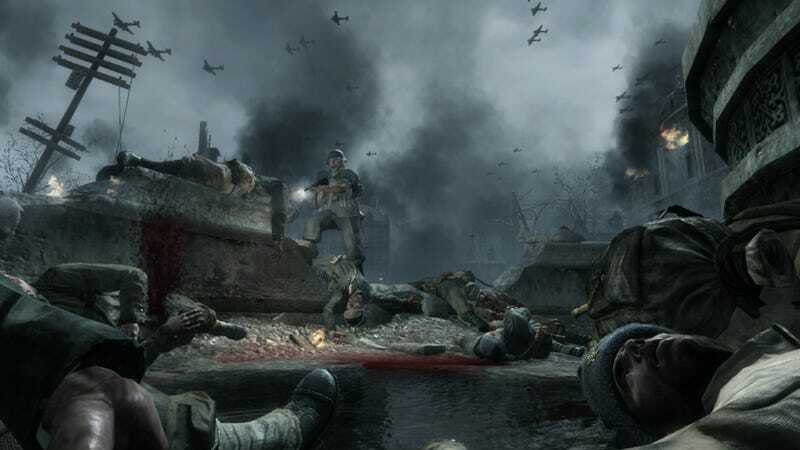 It’s been nearly ten years since the release of Call of Duty: World at War, the last game in the series to dip into World War II before last year’s revival. With a ridiculous amount of hours logged on Call of Duty: WWII, I decided to revisit it recently, using Xbox One’s backward compatibility. It still holds up remarkably well, despite all the hackers. Developed by Treyarch, 2008’s Call of Duty: World at War never reached the same level of critical acclaim as Infinity Ward’s revolutionary Modern Warfare series, which came out around the same time. But it gave us one of the series’ most serious and gory takes on war. Many Call of Duty campaigns will still drop a few jokes or show fellow soldiers busting each other’s chops for the sake of lightening the mood, but Treyarch was all business with this depiction of WWII. World at War allowed players to experience two completely different theaters of the global conflict, flip-flopping between the Pacific and the Eastern Front. The former follows American soldiers in the midst of jungle ambushes set by Japan that span the islands of Makin, Peleliu, and Okinawa. The latter sees the player cast as the Soviets, fighting the Germans in a push towards Berlin. ﻿World at War must hold some kind of record for Most Grenades Thrown By Enemies. The game sets the grim tone from the beginning: as Private Miller, you watch a Japanese officer interrogate and torture another soldier. The interrogator snuffs his cigar out in the soldier’s eye, and you listen to his scream. Eventually your whole squad is killed in front of you, and all you can do is watch the nightmare unfold. Fortunately you get to avenge your fallen brothers with the help of another squad of Marines, replicating the Makin Island Raid of 1942 (a task that is definitely a challenge on Veteran difficulty). The campaign still plays exactly how I remember, and I still struggled at all the same parts. It can be played in solo or co-op modes, but also as a unique hybrid of competitive and cooperative. This competitive campaign is a fun addition that lets you earn points by killing enemies, completing objectives, and keeping your teammates alive despite the barrage of enemy-thrown grenades. At the end of each mission, you’ll see which of you got the highest score, although ultimately you’re all working together to finish the game. This is still by far the most frustrating Call of Duty campaign to play on the veteran difficulty setting. World at War must hold some kind of record for Most Grenades Thrown By Enemies. Sometimes you’ll try to push up on the enemy lines to earn a checkpoint, but you’ll still die by a completely random grenade and be forced to retry. You usually get the option to toss the grenade back, but a successful throwback can require a seriously quick reaction time. It’s kind of like playing a very dangerous game of hot potato. World at War’s multiplayer wasn’t entirely well-received back in the day. Some players griped about the graphics, and some just weren’t ready to go back to a period piece after Modern Warfare’s tantalizing taste of the modern-day setting. But it was a fairly solid experience online. Today, if you can get past the change in setting and rougher visuals, World at War has some great multiplayer maps such as Cliffside, Makin Day, Hangar, and Castle. With the exception of the tiny Dome map, most of Treyarch’s map designs catered to multiple playstyles. Multiplayer is a hacker’s paradise. The overall multiplayer system was pretty similar to Modern Warfare. One unique feature was some larger maps that allow for tank warfare. Tank maps had great open ground for snipers, but you either loved or hated them depending on how you felt about tanks. The rolling beasts were frustrating to disable, even with rockets or satchel charges, but they were an obnoxiously fun way to earn your killstreak. Of course, the responsible way to use the tank was to engage with enemy tanks to offer assistance to your team—but, then as now, not everyone was a team player. The extreme gore of World at War’s campaign also carried over into the online experience. Bouncing Betties were a pesky explosive that could be placed in areas where they were nearly undetectable. They were great for sniping and watching your flank, but triggering a Betty would create a nasty explosion and loss of limbs. When used on small maps, they often left a mess of blood and limbs. But while World at War was one of my favorite Call of Duty multiplayer experiences, my nostalgia was killed almost instantly upon return, via the Xbox One’s backward compatibility. Unfortunately, the current state of multiplayer is a hacker’s paradise, and it is almost impossible to find a hacker-free lobby. I played over a dozen matches and only one lobby seemed to be free of the unkillable “god mode” hack or unlimited killstreaks. There’s pretty much little hope for a fair playing field. One of the most notable features of Call of Duty: World at War was Treyarch’s secret Nazi Zombies mode, the first iteration of this now-classic mode. It could be unlocked simply by playing through the campaign and staying for the end credits. I remember scooping up this game from my local Gamestop and heading home to immediately devour the campaign in a four-hour binge to unlock the Nacht der Untoten Zombies map. Treyarch later unlocked the game mode, making the option accessible to anyone from the main menu, and three DLC Zombies maps were released. The iconic mystery box of random weapons, the ray gun, upgradable “Pack-a-Punch” weapons, and perk machines that we see in more current versions of Zombies all started here in World at War. Nacht der Untoten has been revived over the years, including a remastered version found in Black Ops III’s Zombies Chronicles DLC, but the original map is Zombies mode in its most simplistic form. There are no perk machines to give you faster reload speeds or extra health. No fancy traps to help you thin the herd. It’s a tiny building with nothing but a few choices of guns on the wall and a mystery box. I found the return to the old-school Nacht der Untoten to be a humbling experience. I didn’t survive high rounds because I’ve clearly become reliant on the Juggernog health perk found in the DLC maps. One slip up or bad turn will end your Zombies session. It’s brutal, and I definitely wasn’t prepared. Overall, Call of Duty: World at War was an enjoyable throwback experience for the campaign and Zombies mode. The multiplayer was quite a disappointment, though, with all the hacker commands popping up on the screen to the point that the only way to enjoy the maps without cheaters is to gather up your friends for private matches. Meanwhile, I’ll be patiently waiting and hoping for a remastered version of World at War with hacker-free multiplayer.